This is part of an ongoing set of one-question emails sent to people we know, or would like to get to know, about things that interest us and inform our collective practice. They’ll be featured on the site weekly, usually on Fridays. These questions are more about unfolding ideas than about the people we’re asking, but we do ask those kinds of questions too. We’re pleased to continue this project with a question for a recent presenter at our Homework conference and curator at Cranbrook Art Museum, Sarah Margolis-Pineo. 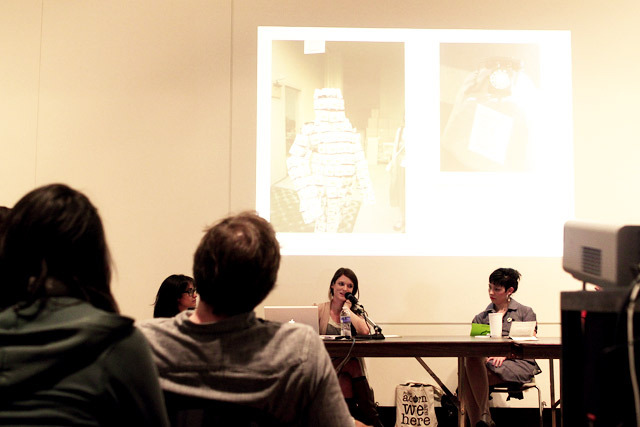 Does the role of a curator need to be redefined to meet the ever-shifting demands of contemporary practices or is it a useful anchor to continually reaffirm the boundaries of contemporary art? It seems to me that curatorial practice has been in continuous flux since the 1970s, and the field will continue shift in relation to various forces including changing creative practices, but also in response to the ebbs of global economies, social and political discourses, new media platforms, and the role of the cultural institution within localities. The late twentieth century saw the emergence of the curator-artist, (not to be confused with the artist-curator), who used the exhibition as a platform to participate in the production of meaning opposed to a venue for preservation and didacticism. In the current moment, the curator can operate simultaneously as community organizer and cultural theorist, bringing together works and projects that are generative—cultivating discourse that contributes to the fabric of social and cultural life both regionally and globally. It’s my feeling that the integration of curatorial practice studies into nearly every MFA program at least in the US is a testament to the evolving nature of the field. Emerging curators are trained in tandem with emerging artists, their practices linked by shared interests, and diverge only in media. I’m assuming your question also serves to unpack how curators will continue to address creative dark matter, which is understood as the vast majority of artistic practice including tactical media, DIY, and artisanal projects, that exist in the shadow of the art world, and further, reject mainstream visibility all together. In part, this work falls in the trajectory of the countercultural movement for its Drop City mentality that relies on craft and sustainable design; but further, it relates to avant-garde resistance that forged alternative cultural spaces, intervened in everyday urban life, and openly critiqued the institution. It’s my assumption that the biennial phenomenon which exploded all over the last decade of the twentieth century rose to meet the demands of alternative creative practices by offering a site for project-based work outside the traditional art institution, (which often strategically ignored the connection between the global art exhibition and political hegemony). It seems that in many ways, the grand show global biennial has been played out, and artists and collectives are again forging new spaces—often aided by 2.0 media, as venues for exhibition, performance, and participation. My question as an emerging curator is how can the museum and regional arts space evolve to become a viable venue for the nebulous dark matter that employs creative practice as a site for social and political engagement? Can cultural producers be complicit with the structure of the institution, exploiting the qualities of the institution that makes it, well, institutional—the Foucauldian heterotopia, an otherspace, separated from everyday life? In essence, how can this unique iteration of cultural practice operate from within established spaces, simultaneously making use of and changing the architecture of institutions? Apologies for addressing your question with additional questions! All I can say with certainty is that the figure of the curator is as much an anchor as the figure of the artist. The two practices are intertwined to contribute to the larger field of cultural work, and I’m eager to participate in this collaborative well into the new century. Sarah Margolis-Pineo is a curator and writer. She received her MA in Exhibition and Museum Theory from San Francisco Art Institute in 2008, and has worked in San Francisco, Philadelphia, and New York. Currently, she is the Jeanne and Ralph Graham Curatorial Fellow at Cranbrook Art Museum in Bloomfield Hills, MI.